Working width: 335 mm | The Blastrac BMP-335EHY is a heavy duty electric scarifier and planer ideally suited for large applications. It's increased weight allows it to generate more efficient scarifying action. The Blastrac BMP-335EHY is a heavy duty electric scarifier and planer. The BMP-335EHY is the answer to the largest scarifying applications. It's increased weight allows it to generate more efficient scarifying action. With variable speed, forward and reverse, this heavy-weight performer can be driven without the scarifying drum engaged. 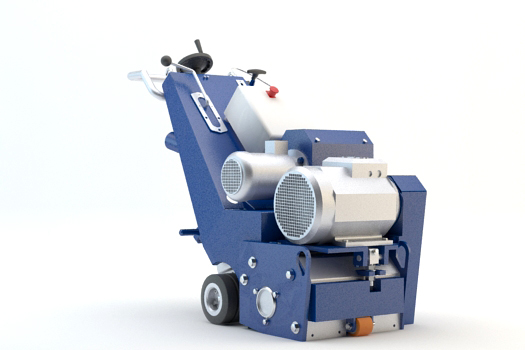 The BMP-335EHY scarifier is almost dust free when connected to the appropriate Blastrac dust collection system. Blastrac has designed a full range of scarifiers and cutters, which give the opportunity to process any floor and specific application. Easy to manoeuvre, minimum vibrations and everything you need to control the machines is within arm’s reach. The handles and lifting eyes make it easy to transport. The working depth of the drum with cutting / milling tools is easily adjustable, and precise to the millimetre. This means no underground deterioration. All Blastrac scarifies are built in a way that all the weight of the machine is centred in order to create a maximum down force on the rotating drum. All our scarifying models come in an electric or a petrol/diesel version to give you even more versatility. Blastrac scarifiers are especially designed so that the drum can easily be pulled out of the machine from the side, without having to move the machine. Our scarifiers, like any other Blastrac machine, do not use any chemicals or waste valuable drinking water. Working width: 215 mm | The Blastrac BMP-215E is electrical powered, perfect for all types of applications. It has an user friendly design, comfortable to use with low vibrations and easy to manoeuvre. Working width: 215 mm | The Blastrac BMP-215B scarifier is petrol powered. It is a compact, powerful, durable and efficient performing machine useful for its easy mobility and maneuverability. Working width: 265 mm | The Blastrac BMP-265E scarifier is powered by an electric motor. It also benefits from a brand new ergonomic design, the new braking system with a steer handle will slow down the machine itself. Working width: 265 mm | The BMP-265B scarifier is powered by a high performance petrol motor. It has a powerful machine that is perfectly suited for medium and even large applications. Working width: 335 mm | The Blastrac BMP-335GHY is the Diesel version of the BMP-335EHY. It's a heavy duty scarifier and planer ideally suited for large applications. Working width: 335 mm | The Blastrac BMC-335EHY is a heavy duty sawing and planer ideally suited for large applications. It's able to remove 3 mm of concrete a time (depending on type of concrete), which saves a lot of time. Working width: 400 mm | The BMP-4000 is a new heavy duty ride-on sawing (shaving) and milling machine ideally suited for large milling and sawing applications, for example road construction and industrial flooring.